Over the Rainbow: Spring is in the Air! I hear that spring is around the corner--so far, I've been too deluged by rainfall to notice any flowers peeking out, but I'm hopeful! 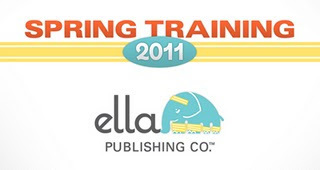 The folks over at Ella Publishing are also getting pumped about spring--check out the new Spring Training program! This extravaganza is coming to a computer near you very soon - and registration starts today! If you sign up this week and you can enjoy all of the above for 20% off the list price! (There is no charge to participate in the daily layout challenge and giveaways). Stop by the Ella Publishing blog The Daily Trumpet for all the details. See you there! I will totally have to check this out. I am in a total slump right now. Doesn't help our kids craft day and my sons big star wars party are these next two weeks. Would love to get inspired to do some more scrappin. think on this, what if you added a little content? grabbed people's attention? I mean "Spring is in the Air!"